The authors of the article below are mad at Erdugan for failing to achieve his Nato's duties. Therfore, he "Should Mind His Own Glass House". The USA will leave Iraq by the end of this year, and there is a fiece struggle about filling the vacum. Erdugan, failed to get a share in Iraq, and with fall of Hariri's govenment, he lost his dream to get a share in lebanon's cake. Consequently, his last hope to be "a would-be “leader” was in Syria, his "backyard", where his Syrian Muslem brothers are ready. According to the Authors,"Turkey failed because Assad knows both the dreadful price of looking weak and that Iran will support him"
Yes, Assad as a member of the axis of resistance, who worked for years to get Turkey in the axis of restance, knows the dreadful price of surrendering to Erdugan's blackmailing, and the consequences of letting Erdgan succeed in adding Syria to "His Own Glass House". Via Syria Erdugan would be a main player in both Lebanon and Iraq, and would save his chance to stay "a would-be “leader”" of the new middle east. He failed and betrayed his Syrian brothers who called him a "coward". We say in Arabic: He tried to satify both his grand mother and grand father, and the outcome was, both are mad at him. طلع لا مع ستو بخير ولا مع سيدو بخير thats exactly what Sultan Erdugan achived. His "zero problems with neighbors" and insistance in staying above the wall ended with tens of problems; not only with neighbors, but with his Nato master, after failing to show substantial results. His Syrian adventure closed his gate to Arab world, and his Irani gate gate to Assia, consequently, he tried his luck in Eqypt, and heard the same advise even from his Egyptians brothers: Welcome, but mind your business. Outwardly, the tour appeared to succeed. Erdogan’s airport arrivals won him “rock star” treatment, and he even addressed the Arab League – the first non-Arab afforded that distinction. Arab Spring activists, worried that hold-over militaries might yet derail their revolutions, marveled at Erdogan’s ability to reassert Islamism and, most recently, his success in bringing Turkey’s generals to heel. But his greatest appeal sprang from his vociferous attacks on Israel, which he threatened with naval war, and the West, whom he accused of seeking to exploit Libya’s wealth. By contrast, he cited Turkey as a long and selfless friend. Here was a man, he would have people say, willing to confront Israel like a Nasser, willing to lead like an Ottoman. But it is in Syria that Erdogan has suffered his most serious setbacks. He had once loudly advertised a regional foreign policy of “zero problems with neighbors"; helped create an EU-like free trade and travel zone with Syria, Iraq and Iran; and backed Syria’s President Assad and Iran’s rulers in their quarrels with the West, even seeking to shield Iran’s nuclear program. But today, Turkey staggers under problems with Syria, Iraq and Iran. 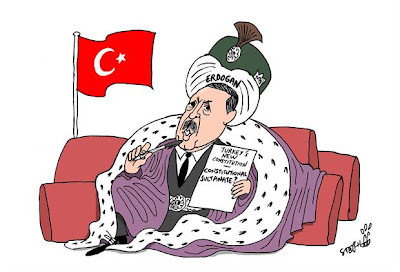 Worse yet, Erdogan has appeared ineffective. The Syrian crisis is the proximate cause, but Erdogan’s problems run deeper still. Turkey failed because Assad knows both the dreadful price of looking weak and that Iran will support him. Herein lies the deeper cause of Erdogan’s failures in Syria: Iran also seeks to lead the region. For that, it needs its proxy Syria. Erdogan is in Syria’s and Iran’s way. So Iran charges that Turkey’s suppression of its Kurdish opposition is no different than Assad’s suppression of his opposition. Iran - which is itself shelling Iraqi territory – refers sometimes to the PKK not as “terrorists” but as “insurgents,” who are an authentic voice of legitimate Kurdish aspirations. As Erdogan squirms, Iran chortles. Indeed, some in the Turkish opposition have begun to denounce Erdogan’s morally hypocritical “glass house.” They ridicule his government’s travels as motion without results. They deride his vanity, a man given to delivering moral sermons whose tests he fails - ironic commentary on the man who still holds with pride the Gaddafi prize for human rights.